For the 1939 American film, see Coast Guard (film). For the 2002 South Korean film, see The Coast Guard (film). A coast guard or coastguard, is a maritime security organization of a particular country. The term implies widely different responsibilities in different countries, from being a heavily armed military force with customs and security duties to being a volunteer organization tasked with search and rescue functions and lacking any law enforcement powers. However, a typical coast guard's functions are distinct from typical functions of both the navy (a pure military force) and a transportation police (a civilian law enforcement agency). 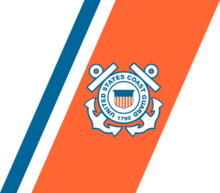 The Coast Guard may, varying by jurisdiction, be a branch of a country's military, a law enforcement agency, or a search and rescue body. For example, the United States Coast Guard is a specialized military branch with law enforcement authority, whereas the United Kingdom's Her Majesty's Coastguard (HMCG) is a civilian organisation whose primary role is search and rescue. Most coast guards operate ships and aircraft including helicopters and seaplanes that are either owned or leased by the agency in order to fulfil their respective roles. The People’s Republic of China used to operate several coast guard agencies. In March 2013, China announced it would combine the assets of four separate maritime law enforcement agencies to form a unified Coast Guard, administrated by the State Oceanic Administration (SOA) The new Coast Guard has been in operation since July 2013. Since March 21, 2018, it has been administrated by the People’s Armed Police (PAP) again, bringing it closer to the formal status of a military force. The current China Coast Guard (CCG) (Chinese: 中国海警) serves as a coordinating body for maritime search and rescue in the territorial waters of the People’s Republic of China. The CCG was previously a maritime branch of the Public Security Border Troops, a paramilitary police force under the leadership of the Ministry of Public Security (MPS). Since 2013, it has been administered by the State Oceanic Administration. On March 2018, it has again been placed under the leadership of the People’s Armed Police, which is under the direct command of the Central Military Commission (CMC). The former China Maritime Safety Administration (CMSA) (Chinese: 中国海事局) was a government agency which coordinated maritime search and rescue in the territorial waters of the People’s Republic of China (PRC). The CMSA was part of the Ministry of Transport (MOT). The former China Marine Surveillance (CMS) (Chinese: 中国海监), created on October 19, 1998, was a paramilitary maritime law enforcement agency of the State Oceanic Administration of the PRC. The force was responsible for enforcing laws and order within China’s territorial waters, exclusive economic zones (EEZ), and shores; protecting the maritime environment, natural resources, navigation aids and other facilities; and carrying out maritime surveys. In emergencies, these forces could also be deployed for other missions such as search and rescue. The former China Fisheries Law Enforcement Command (FLEC) (Chinese: 中国渔政), an organ of the Fisheries Management Bureau under the PRC Ministry of Agriculture, was responsible for the enforcement of laws concerning fishing and maritime resources within the PRC’s territorial waters and exclusive economic zones (EEZ). The FLEC’s responsibilities included protecting Chinese fishing vessels and personnel, resolving disputes in fishing activities, preventing illegal fishing, and protecting maritime resources. The Egyptian Coast Guard, part of the Egyptian Navy, is responsible for the onshore protection of public installations near the coast and the patrol of coastal waters to prevent smuggling. In the French Republic, Affaires maritimes is the closest organization to a coast guard. In each region, a naval admiral, called préfet maritime, is in charge of coordination of all state services for action at sea (Navy, Affaires maritimes, gendarmerie, customs, fisheries surveys...). The charity, Société Nationale de Sauvetage en Mer, provides most life saving duties at the local level. 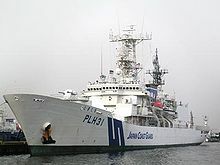 Japan Coast Guard Shikishima (PLH 31) is the largest patrol vessel in the world. A Bombardier Dash 8, modified to act as a Maritime Patrol Aircraft, in Japanese Coast Guard service. The Libyan Coast Guard, part of the Libyan Navy, is responsible for the onshore protection of public installations near the coast and the patrol of coastal waters to prevent smuggling. 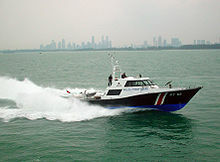 In Malaysia, the Malaysian Maritime Enforcement Agency (MMEA) or Malaysia Coast Guard is part of the Malaysian Civil Service and is under the Prime Minister's Department. The Agency is headed by a[Director General] who is appointed by the Yang Di Pertuan Agong (King) on the advice of the Prime Minister while other personnel are appointed by the Public Service Commission. In times of war, crisis or emergency, the Agency may be placed under the command of the Royal Malaysian Armed Forces. It was formed to combat the rise of piracy in the Strait of Malacca ("The Straits"). Personnel often work very closely with the Royal Malaysian Navy and Royal Malaysian Air Force. The Coast Guard operates a Special Forces Commando or STAR (Special Task and Rescue) unit, which was absorbed from the Navy's PASKAL and Air Force's PASKAU. The agency utilizes its resources in a maritime law enforcement and search and rescue capacity. The Maritime Search and Rescue (Búsqueda y Rescate Marítimo) is a coast guard-type unit of the Mexican Navy. Its primary mission is search and rescue operations within 50 miles (80 km) of the Mexican coastline. The Swedish Coast Guard carries out some of its surveillance by air (from its base in Skavsta near Stockholm), and some on ice and snow (from its Luleå station). 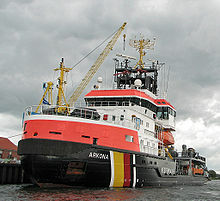 It also has marine duties in Lake Vänern, Europe's third largest lake, operating out of Vänersborg. The Turkish Coast Guard of the Republic of Turkey (Turkish: Sahil Güvenlik Komutanlığı) is a branch of the Turkish Armed Forces and was initially founded in 1859. During peacetime, it is under the command of the Ministry of Interior. However, during war or emergency time, it falls under the command of the Turkish Navy. On July 13, 1982, it was assigned to the Turkish Gendarmerie becoming both a military and a law enforcement service. Finally, the organization obtained its current form on January 1, 1985. National Security cutters, the USCGC Bertholf and USCGC Waesche, cruise together. ^ "The History of H M Coastguard". Wikimedia Commons has media related to Coast Guards.